Provide comfort for the family of Dorothy McMahon with a meaningful gesture of sympathy. It is with great sadness we say Goodbye to a beautiful woman whom we all called “Auntie Dottie”. Dorothy A. McMahon closed her eyes Friday afternoon at Meadow Green Nursing Home in Waltham after living a life of loving others. Dorothy was born in Newton, Massachusetts and moved to Waltham as a young woman and had lived here most of her life. She was ready to travel at the drop of a hat and loved traveling to the Casino and could usually be found with her late girlfriend Hazel Weir traveling to here and there. 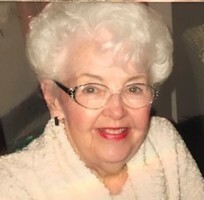 In her younger years her career was in retail jewelry and she ran the jewelry and cosmetics department of the Red Cross Pharmacy for many years until that store was sold. For several years she was a clerk at Waltham City hall after which she became Warm Welcome of her Nephews funeral homes The Brasco & Sons Memorial Chapels in Waltham and Belmont. After only a short time she became known by all the employees as “The Boss” “Auntie”, who was always quick to sew on an employees button, remind one of the men to shine their shoes, or she would buy them a pair of gloves, or scarf etc. She was a stickler of the cleanliness of the funeral homes and never stopped polishing, dusting when she was not waiting on someone or assisting with visitors to the funeral home. An avid reader of the supermarket tabloids, Auntie was quick to share why “Roger Clemons was such a good pitcher” it was because she read in a tabloid that he had a computer chip put in his eye……We already miss enlightening news she used to share with all of us. She looked so much like her cousin the late Mildred R. Brasco one of the founders of the funeral home that she was often mistaken for Mildred. Her love of children was incredible and never ending, she could not wait the bring the children to see Santa Claus and the Easter Bunny at Grover Cronin’s over and over, according to Wayne Brasco Sr., “Auntie would take me once a week continuing to ask my Mom let me bring him again, and always pleaded to take me to a Parade, and she did the very same with my five children”. She even brought smiles to all she met singing her Irish Lullaby’s with the grandest of smiles. She always appeared to have her hair professionally done before coming to work each morning. She was the sister of the late James McMahon, Edward McMahon, William McMahon Shirley McMahon, Anne McMahon, Madeline Fitzsimmons, Russell McMahon. She leaves her Niece, Mrs Donald ( Kathleen ) Maines of Millis who was her devoted caregiver in her last years, her brother Robert McMahon of Newton. Auntie leaves many Nieces & Nephews and grand Nieces & Nephews. Services will be held Tuesday morning at 9:00 a.m from the Brasco & Sons Memorial, 773 Moody Street, Waltham with a Mass Christian Burial at the Sacred Heart Church, River & Newton Streets, Waltham at 10:00 a.m. Interment will follow at Newton Cemetery. Visiting hours will be at the funeral home on Monday from 4 - 7 p.m. Flowers are appreciated or expressions of sympathy may be made in Dorothy’s name to “Marys Wish for Children” c/o The Village Bank, Atten: Slater Cram, 307 Auburn Street, Auburndale, Ma.02466 Parking attendants will be on duty. To send flowers in memory of Dorothy A. "Auntie" McMahon, please visit our Heartfelt Sympathies Store. Provide comfort for the family of Dorothy A. "Auntie" McMahon by sending flowers. Dear Wayne, Gail, Kenny and Kevin Sorry to hear about Aunt Dottie. I had a lot of good times with her and Millie. My condolences to the Brasco family on the loss of Auntie. She was a dynamic woman who brought love and light to all who knew her. My brief experiences with her at the funeral home remain some of my fondest memories. If heaven didn’t sparkle enough it definitely will with Aunties influence. God bless.